Today’s puzzle is another original puzzle called Number Circuits. I originally named these puzzles Magic Puzzles as they are based on Magic Squares. However, when Mindware published them in book form (acually two books), they changed the name. 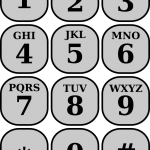 Number Circuits are easy to understand – all you need to do is to place the given numbers into the small circles following the simple rules (or directions). In order to correctly solve these puzzles, you will only need to use basic addition and your deductive reasoning skills. Here are two Number Circuit puzzles from my second book for you to try – Click here for a pdf file. If you like these Number Circuit puzzles, take a look at the books of Number Circuits that I wrote which is available on mindware. Good Luck and pass the puzzles onto others who may enjoy them! 2. The number in each yellow hexagon is the sum of the numbers in the three white hexagons that point to it (with a black triangle). Here’s a snowflake puzzle for you to try – Click here for a pdf file. If you like the snowflake puzzle, take a look at the book of 100 Kuruko Puzzles that I wrote which is available on Amazon.com. Good Luck and pass the puzzles onto others who may enjoy them! Today’s puzzles are Hex Codes. Each puzzle is a collection of adjacent hexagons that follow a pattern. Each hexagon contains either a number/letter or is empty. 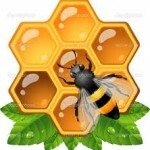 The objective is for you to fill in empty hexagons with the correct number/letter that follows the given pattern. You must determine the pattern that each puzzle exhibits in order to correctly complete each puzzles. The hexagons may vary in color which may be of importance (hint, hint, nudge, nudge). 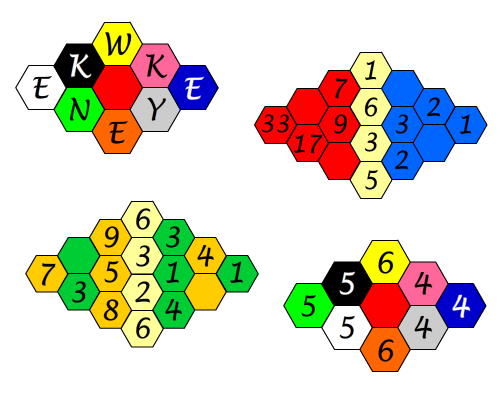 Some of the puzzles may use addition or subtraction, while others may utilize some other connection (like adjacent hexagons or the color) between certain attributes. That’s all for you to figure out. These puzzles can be very challenging. 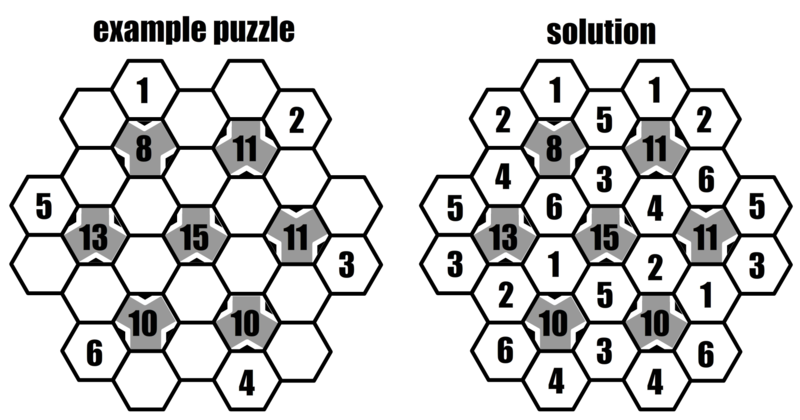 All you need to do is to figure out the pattern in each puzzle and then use it fill in empty hexagons. Below are four puzzles to try. If you like them, click here for a pdf file with more. Best of luck! As always, I hope you enjoyed these puzzles. Please pass them onto others who may enjoy them! Rule 1. The number in each gray hexagon is the sum of the numbers in the three white hexagon pointing to it. Rule 2. Each gray hexagon is surrounded by the numbers 1 through 6 once and only once in each of the six surrounding white hexagons. In the above example, notice the 8 in the upper left gray hexagon. It is surrounded by six white hexagons containing the numbers 1,2,3,4,5 and 6. Of these six, three are pointing to the 8, these contain 1,3 and 4 which sum to 8. Similarly, the 11 in the upper right gray hexagon is pointed to by 5,2 and 4 which sum to 11. Now for the puzzles. Below are two Kuruko puzzles from my Kuruko puzzle book containing 100 original Kuruko puzzles. Just following the simple rules to solve and Good Luck! I hope you enjoy these Kuruko puzzles. If you like them, check out my book of 100 Original Kuruko Puzzles available on amazon.com. It’s a great and challenging collection of puzzles. Good Luck and pass the puzzles onto others who may enjoy them! In this example, there are eight different letters each matched with a unique number, so F=1, O=3, U=6, R=7 and so on. Make sure you understand the example. When you do, try the following puzzles. I have created three interactive puzzles below. The first puzzle has eight unique letters (L,E,T,I,S,N,O,W) with only T duplicated. Use any of the numbers 0 through 9 (two numbers will not be used) to solve. There are numerous solutions. Enter your answer in the boxes and select Check when complete to check your answers. The second puzzle has eight unique letters (F,O,U,R,N,E,I,V) with F,O,E duplicated. Use any of the numbers 0 through 9 (two numbers will not be used) to solve. There are numerous solutions. An extra challenge is to try to solve this puzzle using only the numbers 0 through 7 (try not to use 8 and 9). Enter your answer in the boxes and select Check when complete to check your answers. I’ve heard it said that two wrongs don’t make a right, but three lefts do! The third puzzle has eight unique letters (L,E,F,T,R,I,G,H) with L,E,F,T duplicated. Use any of the numbers 0 through 9 (two numbers will not be used) to solve. There are numerous solutions. 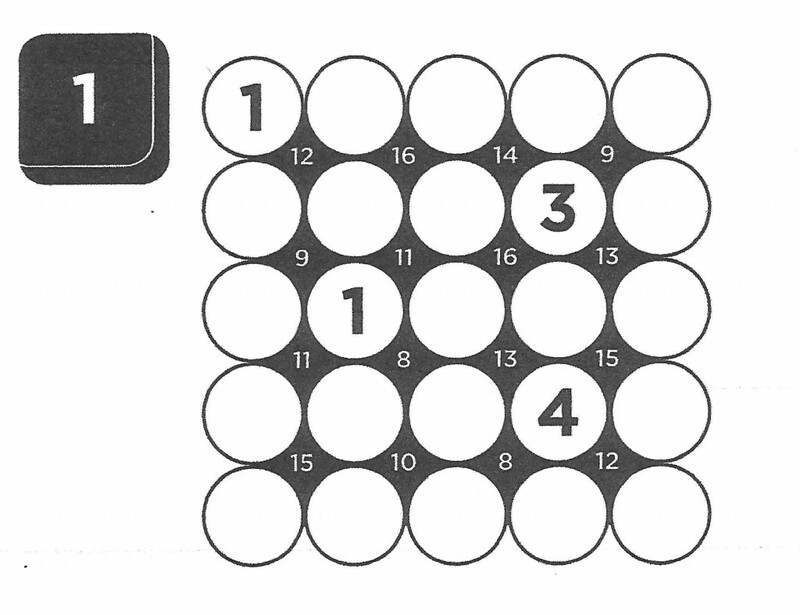 An extra challenge is to try to solve this puzzle using only the numbers 1 through 8 (try not to use 0 and 9). Enter your answer in the boxes and select Check when complete to check your answers. I hope you enjoy these puzzles. Good Luck and pass the puzzles onto others who may enjoy them! Today’s puzzle is a Number Sense Puzzle. They are geared for younger puzzlers to help them improve their number sense. However, many have requested more challenging puzzles, so I have included a second more challenging puzzle for older puzzlers (just click the link below). In each, there are 8 statements each corresponding to a number. You have to use the numbers 0 through 9 once and only once to fill in the correct number for each statement. You will need to use and develop your deductive problem solving skills in order to correctly place the numbers. Since there are only 8 answers and 10 numbers (0 through 9), some of the answers will require two digits. I created an interactive puzzle that will automatically check your answers and provide feedback. I also created a pdf file that can be used in classrooms or with pencils for those so inclined. The goal is to have fun and challenge yourself. I hope you enjoy these puzzles. 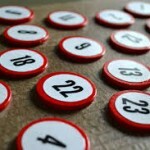 If you find these interesting, Click Here for a selection of more Number Sense puzzles that I’ve created. I will be adding to the selection over time. Good Luck and pass the puzzles onto others who may enjoy them! It’s my favorite today – Math Riddles! These are all original. Some are from my riddle book Riddle-Me Math and some are new. I love riddles because they are often very simple to state, but at the same time, very difficult to solve. There are five riddles below, dealing with numbers and relationships (e.g. proportions). 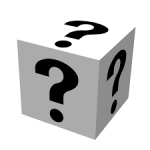 Riddles typically require a bit of thought and their solutions may not be immediately seen. That’s the challange! Don’t give in, keep thinking about them and try to get each solution without being told. Your first few guesses may seem crazy, but keep plugging along – even the best riddlers take their time and make a few mistakes. 1. What is the only number with the same number of letters as its name? 3. What number is equal to five times the number of letters in its name? 4. If a month lasted only an hour, then a year would last how long? 5. If a dime was a year, then what would a dollar be? I hope you enjoy these riddles. Good Luck and pass the puzzles onto others who may enjoy them! Here’s another Number Sense Puzzle. Today’s puzzle centers around another fundamental skill that gives many students a really difficult time – Order of Operations. This is geared to younger puzzlers to help them improve their Order of Operations skills. As always, let me first give a general introduction. There will be 8 statements each corresponding to a number. You have to use the numbers 0 through 9 once and only once to fill in the correct number for each statement. 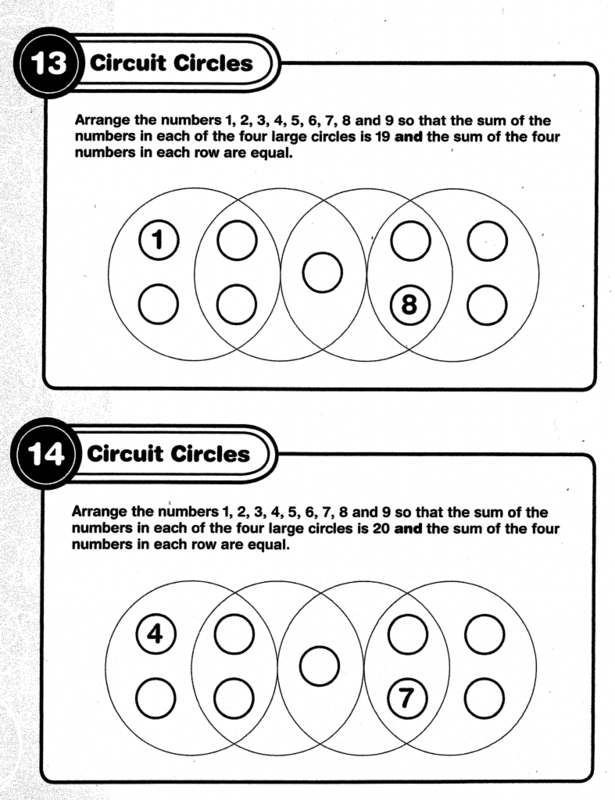 You will need to use and develop your deductive problem solving skills in order to correctly place the numbers. Since there are only 8 answers and 10 numbers (0 through 9), some of the answers will require two digits. In this puzzle, some of the answers will be negative, that’s no problem, just make sure the digits use 0 through 9 once and only once. I created an interactive puzzle that will automatically check your answer and provide feedback. I also created a pdf file that can be used in classrooms or with pencils for those so inclined. The goal is to have fun and challenge yourself. Too often I see children jump right to step 5 and try to solve the puzzle (or problem) without doing all or even any of the preliminary steps. Although skipping steps is sometimes faster, it is all too often unsuccessful. Go Fast Slowly is what I tell them. Take your time. Speed is not important. However, getting the correct answer and improving are both REALLY important! Please take a look at the supporting materials and give the puzzles a try. Remember it’s about having fun and getting better at the same time! 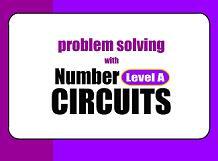 Below is a collection of six interactive Number Circuit puzzles for you to try! I hope you enjoy these puzzles. If you find these interesting, Click Here to view our complete collection of puzzle books. Good Luck and pass the puzzles onto others who may enjoy them!